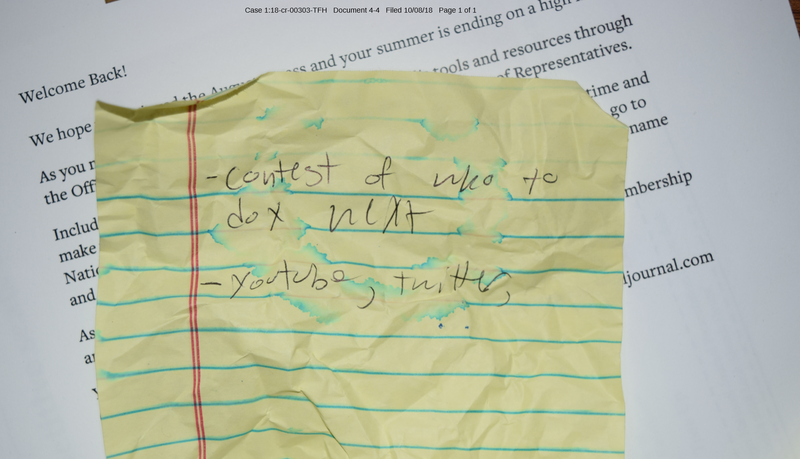 The former Senate aide accused of doxxing Republicans during Supreme Court Justice Brett Kavanaugh’s confirmation hearing allegedly possessed troves of information, including Senate data, court proceedings indicate. The suspect is the son of a wealthy family with ties to Dianne Feinstein, the Senate Judiciary Committee’s top Democrat. Republicans suggested she timed a leak about sexual assault allegations against Kavanaugh to harm his confirmation chances. The court barred the media from hearing details about the alleged breach, and now a plea deal that could prevent the truth from ever emerging appears to be in the works. A former Senate aide charged with doxxing Republican senators and extorting a witness comes from an elite family with ties to Sen. Dianne Feinstein, the top Democrat on the Judiciary Committee. “He downloaded more information than was originally understood. There is no combination of conditions that could ensure the safety of the community,” Hogan said in December 2018. Prosecutors underscored that he was a flight risk and that they had concerns he would engage in obstruction of justice. The suspect’s father, Greg Cosko, is the CEO of Hathaway Dinwiddie, a massive construction company that built a university building named after Feinstein’s husband. He serves on the board of San Francisco State University alongside Willie Brown, the California politician who said he helped make the career of California’s other Democratic senator, Kamala Harris, with an illicit affair. As former chairman of the San Francisco Chamber of Commerce, Greg Cosko hobnobbed with then-House Minority Leader Nancy Pelosi, Feinstein and others. The elder Cosko’s adult son appears to have made inroads in Washington via an internship with Feinstein. Jackson Cosko appeared to have absconded with vast troves of data months before the confirmation hearing, and even allegedly had Senate letterhead. Even after he was caught, he continued to make threats, Hogan said. “There’s been some complex discovery with terabytes of information. The defendant is cooperating but the government isn’t convinced that he is fully cooperative. Some of what was provided under discovery is Senate information. The Senate is subject to a privilege called speech and debate,” he said at a January court date before closing the proceedings to the public. The speech and debate clause gives congressmen a form of limited immunity against lawsuits and criminal prosecution, and congressmen sometimes use it to try to prevent their information from being used as evidence in court cases. At December and January court dates, Hogan barred The Daily Caller News Foundation from the courtroom as lengthy proceedings went on, even though Cosko’s mother was allowed to stay. The judge assured that what was said would become public eventually. Democrats had numerous opportunities to prevent Cosko from his alleged breach on the Senate’s IT systems. Notwithstanding their stated indignation about the hacking of the Democratic National Committee, Hassan hired Cosko despite an existing felony record. Congressional officials previously told TheDCNF that IT aides have the “keys to the kingdom” and the ability to see all the computer files in an office. Compounding matters, Rep. Sheila Jackson Lee picked up Cosko after he was booted from Hassan’s office. The Texas Democrat’s office refused to say whether she checked with Hassan as a reference or did a criminal background check. Feinstein was previously accused of having a Chinese spy working in her California office, but allowed him to retire and covered it up. He was never criminally charged — helpful in avoiding media attention — and she never discussed it publicly until it leaked out years later. Even then, she refused to name him and falsely characterized him as simply a driver. He is still working in the U.S.
Luke Rosiak is the author of the new book Obstruction of Justice: How the Deep State Risked National Security to Protect the Democrats.